So today for Teacher Week I was SUPPOSED to show you pictures of my classroom. So I went into school today and took my nice new camera and intended to get a whole lot done so I had something new to show you. BUT.... after being there for about an hour and getting a few small things accomplished but mostly making a big ol' mess, we had an EARTHQUAKE. Yep. 5.8 on the Richter Scale centered about 30 miles from my school. My school is near a rock quarry so we are used to feeling some minor shakes when they do blasting from time to time. This shook for a good minute or so, and I thought my Promethean projector was going to snap off. We all remembered our training and ran to stand in the doorways (but I think that was mainly to see what other people were doing). About 45 mins later the buildings were evacuated and we can't go back until risk management inspects the building. When it was all said and done, it was scary but more a minor inconvenience than anything else. No one was injured and our building seemed fine with no visible damage. Some older buildings in the area, including the National Cathedral and the Smithsonian Castle in Washington D.C. did have some damage. ANYWHOO... Since I don't have any new pictures of my room, I'm going to show you pictures of what I did instead of working in the classroom. A friend saw my crayon rolls and asked if I would make her a crayon portfolio like this for her daughter. I found a free pattern here and changed it up a bit to get more crayon pockets. I didn't have any crayons at home so I put in the color pencils just for the purposes of the photo but it was an epic fail. It holds 16 crayons and computer-size paper cut in half. This I didn't make but I thought it was worth posting. My cousin is famous across the family for her aprons so I asked her to make me a craft apron for school. I love the bird pattern and the colors. Very my style. AND if you MUST see pictures of my room, you can check out these posts! Go to Blog Hoppin' to see who else linked up with pictures of their classroom. I have to say that this is my favorite day of Teacher Week and I'm sorely upset with myself about not living up to my own expectations, but I can't wait to snoop on other people's classrooms! I am going to take my camera to school today to take more pictures, too. I love the apron and the crayon portfolio...soooo cute. I will check back to see your pictures!! I can't imagine a 5.8 earthquake. Glad you are safe. Have a great day! 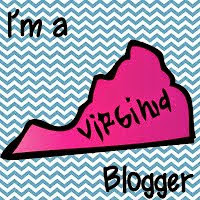 I have several friends who teach up in NoVa and in Richmond. Pretty sure I would just about DIE if I had kids in the room when that happened. Glad you guys aren't in school yet!! I was wondering how the earthquake felt closer to the center...my family felt it in a bit. We've been in for almost 2 years and we've only felt 2 small ones. Everyone says the big one is coming and I'm just hoping that when it does come it does happen while I'm at school, that would be terrifying. I'll check back when you get your room done...Im not done either so I understand. I live in Charlottesville. Whew, that quake rattled my nerves! I teach in Orange. Today was supposed to be our first workday, and they closed the buildings to inspect everything! Craziness! CUTE portfolio, and I ADORE the apron (especially the fabric!). Some people down here in SC felt the tremors, but I never felt anything. That stinks you couldn't go back and get stuff done! I love work days! Glad you are safe and okay! Good luck on your room when you are allowed back in.